Food Wishes Video Recipes: Béchamel Sauce - Let’s Turn This “Mother” Out! This is the sauce I mentioned in the Broccoli post yesterday, and no, I hadn’t posted it. So here you go. This is one of the five “Mother Sauces.” In traditional culinary training, students first master these mother sauces and then use them to create literally hundreds of variations. 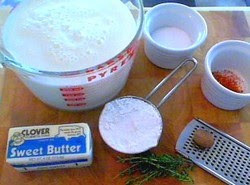 Béchamel is the basic “white sauce” and is used in many popular dishes. I’ll admit, this is not the most thrilling lesson ever, but it is an important one as far as building a solid foundation of classic culinary skills. As far as product recommendations go, make sure you have a decent sauce pan to make this in. Don’t use cheap pans, since they have very thin bottoms and the sauce will scorch. In the clip, I used this 4-qt. Stainless Sauce Pan, and it should work for you too. Also, a Wire Whisk is a must, but you probably have one of those already. Lastly, you’re going to see me grate fresh nutmeg into the sauce. If you’ve never done this, you’ve never really tasted nutmeg! The ground stuff in the grocery stores goes stale very quickly and really loses its flavor. I made this a while ago when you posted the Crouque Monsouir demo (They were amazing!) and I used it all at once. My question is how long this sauce keeps in the fridge? BTW Keep up the Great Work!!! it will keep for at least 2-3 days. WORD ON THE STREET IS YOU REALLY DON'T KNOW HOW TO MAKE A CHEESE SOUFFLE -- YOU GONNA STAND FOR THAT? You do realize I can delete any comments I want. Especially ones from souffle crazed cyber stalkers!! PATIENCE will be rewarded. Would you be able to freeze this sauce to save for later use? And if so how long would it last? You can freeze, but no idea of the max time. I have lost hours and hours on your blog site! I love you! You are so talented and belong on the Food Network with your own show! I am of course your newest follower (aka stalker). You are so easy to listen to and your videos are just wonderful! Thank you so much! I was wondering if I wanted to add mushrooms to make a sort of Alfredo sauce, what step would I add it in. And is this the way to make an Alfredo sauce? I hate the ones that come premade in the store. I am learning about the mother sauces and want to understand in great detail. So, as you mentioned, often cooks will recommend heated milk for the roux. What is the rationale behind that thinking? And why do others often specify "clarified" butter. Does that change the needed temp of the milk? Can't give you the science, but it's ALWAYS cold liquid into hot roux! This way you never get lumps. I have no idea why people still do that. Also, not sure about "clarified" butter. Bottomline, use cold milk! Mine 'broke' after I added a portion of too much milk. But no fear as I remembered your video on 'how to fix a broken Hollandaise Sauce' and applied that. Word up Chef John! I've come along way in my Culinary journey thanks mostly to you. I've always enjoyed learning but never was one for school, glad this whole internet thing turned out. You're a Culinary BadAss. I share your videos with my friends that are too afraid to cook for themselves. You simply break it down, and take the difficulty away. "It's Easy", I say. "Watch Chef John's humorous video." I'm really interested in the Five "Mothers of All Sauces". Please share with us. If you've already shared them, it's my bad. Getting ready to build this mac n cheese for the first time. Elbows already cooked and staged. Thanks for making cooking fun. HI, went to a resturant in Key West who serves what they call Chicken Brocaliini, it has chunked chicken, carrots, peas, a white sauce the waiteress said was this beschmel or close to it, she said they add grated cheese on top, must be a white cheese and white or clear cheese melted into the sauce, Perhaps parmessian? Trying so hard to make it close the their recipe. Oh yeah and a pasta that had a bit of unmelted grated white or clear cheese on top. I just crave that dish,,,, any suggestions on how to make the sauce taste well with those things? Lord knows I can use the help. I can not dectect spices well. Appreicate any help you can throw my way. What kind of flour would you use to make this gluten free? Whenever I make a roux, I use Wondra. Because it is called ‘Wondra’.